Haida Gwaii aka Queen Charlotte Islands is dubbed the Galapagos of the north! A vast wilderness, of magnificent old growth rain forests, ancient aboriginal culture, and abundant wildlife, the Queen Charlotte Islands in British Columbia are one of the richest biological and cultural regions of North America, plus one of the most beautiful and diverse landscapes in the world! Made up of 1,884 islands, the Queen Charlotte Islands, are both a geological and geographical treasure chest. A mix of wild beaches, some rock-shrewn and covered with fossils, others sandy and dotted with sand dunes. Lush marshes provide ideal nesting for waterfowl, while the rain forest provides a protecting canopy which allows the abundant flora and fauna to thrive in this Galapagos of the North! The Queen Charlotte Islands have been the ancestral home of the Haida people for thousands of years. These ancient people named the remote archipelago Haida Gwaii, and in Haida legend, it is the place where time began. The natural history of Haida Gwaii is extremely diverse and supports many subspecies of flora and fauna which differ from those found on Canada's coastal mainland, as well as many species that exist nowhere else in the world. This is thought to be the result of the Islands escaping the last ice age and becoming a refuge for various forms of plant and animal life, which continue to flourish there to this day. The largest land masses of the Queen Charlottes are known as Graham Island and Moresby Island. These islands share common features including many inlets, bays, and sounds which penetrate the land from all sides, as well as extensive wilderness area, and distinct flora and fauna which have evolved over thousands of years. Graham Island is the largest and most heavily populated of the two, containing several significant communities. A distinguishing feature of Graham Island is Naikoon Park, which is one of two large parks found on the Queen Charlottes. Naikoon Park features two ecological reserves: Tow Hill and Rose Spit. Tow Hill is a prominent landmark in the park, a massive outcrop of basalt columns rising from flat bogs at the mouth of the Hiellen River. Tow Hill rises 109 metres in height and is the second highest point in the park after Argonaut Hill (150 metres). Rose Spit offers excellent viewing of migrating birds, who rest at Rose Spit and feast on the abundant food supply rendered by the up welling ocean currents. Moresby Island is the smaller island of the two and the least accessible, offering less than 30 kilometres of public roads, many of which are located in the town of Sandspit and along the Skidegate Inlet. Moresby Island also encompasses the Gwaii Haanas National Park Reserve. Gwaii Haanas is translated to mean - the place of wonder. 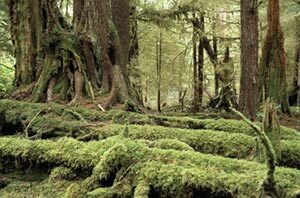 The Gwaii Haanas National Park Reserve is dominated by the San Christoval Mountains which reach an elevation of 1,123 metres. There are vast varieties of flora between the meadows and bogs of the lowlands to the mountain peaks, in fact the Queen Charlottes hold the largest concentration of biomass or living matter than anywhere else on the planet. Gwaii Haanas National Park Reserve also embraces the ancient and now abandoned Haida village site of Ninstints on Anthony Island. Ninstints Village was designated a UNESCO World Heritage Site in 1981 in recognition of its cultural value and importance to the history of mankind. It is here that lies the foundation of insight into the history of the the Haida people and their way of life through the remains of houses, carved mortuary and memorial poles. Other abandoned Haida village sites on Moresby Island outside the boundaries of Gwaii Haanas include Skedans and New Clew on Louise Island, and Tanu on Tanu Island each with treasures of their own including some of the finest examples of original totem poles in the world. The Haida is a nation legendary for its art. This artfulness is seen as a way to preserve their connection to the past, inspired by their ancestors, and shaped by their surroundings. Today, people are attracted to the Queen Charlotte Islands because of their relative isolation, recreation, and native culture. 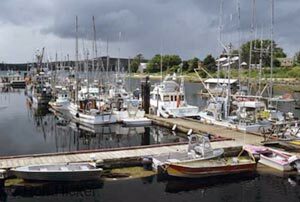 Kayaking, cultural enlightenment, boating, whale watching, beachcombing, camping, hiking, and fishing are among the main draw cards of visitors to Haida Gwaii, as well as the undisturbed, pristine wilderness.